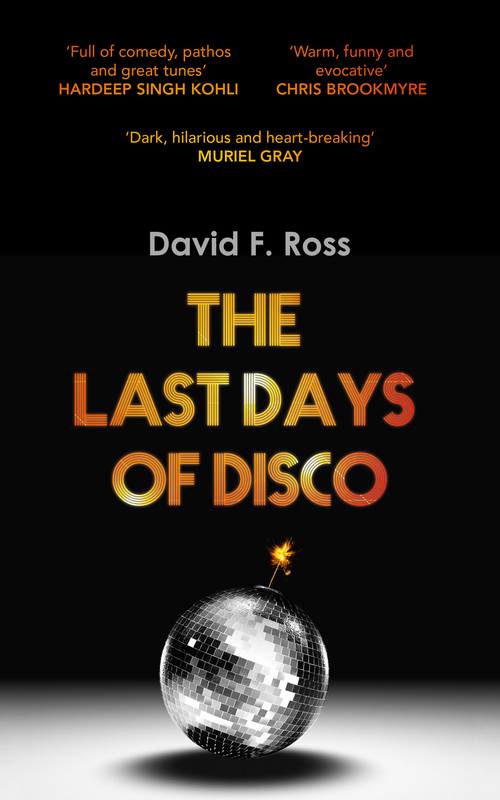 This is my first ever participation in a blog tour, and I was delighted to be asked by Liz (@Lizzy11268) over at LizLovesBooks to review The Last Days of Disco by David F. Ross. compensation from an accident at work, Bobby’s dad Harry invests in the fledgling business. His marriage to Ethel is coming apart at the seams and the disco has given him something to focus on. Tragic news from the other side of the world brings all three strands together in a way that no one could have predicted. The Last Days of Disco is a eulogy to the beauty and power of the 45rpm vinyl record and the small but significant part it played in a small town Ayrshire community in 1982. Witty, energetic and entirely authentic, it’s also heartbreakingly honest, weaving tragedy together with comedy with uncanny and unsettling elegance. A simply stunning debut. Ah, the eighties. Brings back happy memories of my youth and David Ross captures the mood and spirit of the time impeccably, with a wonderful cast of characters and a fabulous soundtrack. It’s a funny book. And a sad one. Against the fun and hijinks of Bobby and Joey setting up their ‘Heatwave’ mobile disco (and they have a *lot* of each! ), there’s Bobby’s brother Gary and his adventures in joining the army – and given the timeframe there’s really only one way that could be headed. The threat of the Falklands conflict looms large over the story, with quotes dropped in from Thatcher as the story progresses – it’s a deft touch and builds a real sense of tension. We also meet the fabulous Fat Franny Duncan, a local small-time gangster boss and as king of the mobile disco scene, the main opposition to the boys’ mobile disco success. Definitely one of my favourite characters in the book! Ross has a remarkable talent for evoking a real sense of place in his writing. You feel that you know these people, this town as you get further into the book. I did feel there are definite echoes of the late, great, much missed Iain Banks here – there are plenty of comparisons to be drawn, with a sprawling Scottish small-town cast, delicately intertwined plotlines, social commentary and a deft turn of often quite black humour. It’s a remarkable debut from an author who I’ve added to my list of writers to watch in the future. He’s set the bar pretty high though, and I can’t wait to see what he comes up with next! And if you missed yesterday’s stop, head over to The Book Trail It’s well worth a visit as we get to see some of the locations in the book itself courtesy of the author. Disclosure: Thanks to Orenda Books for sending me a copy of the book to review and to Liz for organising it. The opinions in the review are entirely mine.